Off late it seems as though the ayurvedic toothpaste market in India is on the bloom. People are opening up to the idea of natural toothpastes because of its enormous benefits. To start off, natural toothpaste contains no artificial chemicals, preservatives or sweeteners hence cannot have any side effect at all. These teeth whitening toothpastes utilize plant and fruit extracts in lieu of Sodium lauryl sulfate which causes the foaming and lathering effect. This ingredient actually burn human skin and may liver inflammation. Such is the level of intensity created. 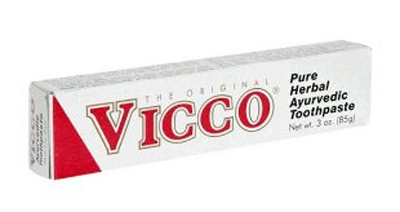 Vicco Vajradanti Ayurvedic Toothpaste contains pure extracts of as many as 20 herbs and barks to protect your teeth from all possible dental problems like plague, sore gums etc. and maintain proper oral hygiene. This natural and organic toothpaste is one of the best ayurvedic herbal toothpastes found in the Indian market. Ingredients such as laung, pudina and tomar relieve toothache and fights bad breath. The mint or mentha content helps in tooth whitening and keeps your fresh all day long. Neem Ayurvedic Toothpaste is another popular herbal toothpaste with active ingredients that help in fighting tooth decay, removes dental plaque and other problems related to oral hygiene. It comes with powerful antibacterial and astringent properties of Neem. 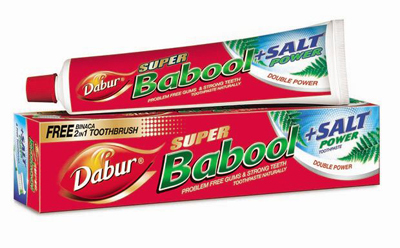 Dabur Babool Toothpaste is natural toothpaste popular in the Indian market. It has made from medicinal benefits of Acacia Arabia that is responsible to keeps gums healthy and strong. This teeth whitening toothpaste takes care of total oral hygiene. Treats skin diseases, piles and general debility. Remove and reduce plaque and tartar formation. Himalaya Herbal Complete Care Toothpaste has the goodness of pomegranate fruit rind known for its astringent, antibacterial and antioxidant properties. Ingredients like Fluorspar, Five-leaved Chaste Tree, Triphala etc. prevents toothache, decay and combat dental plaque. 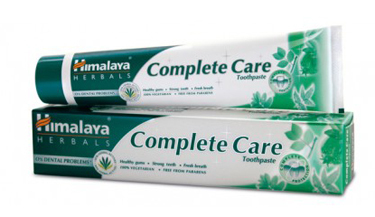 Takes care of periodontitis, gingivitis, dental plaque, halitosis etc. 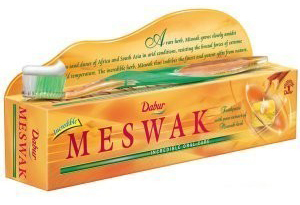 Dabur Meswak toothpaste is known in the market for its excellent oral hygiene benefits. Ingredients like calcium carbonate, sorbitol, water, silica, sodium lauryl sulphate etc. reduce tooth decay, fight plaque and prevent gum diseases. Auromere Ayurvedic Herbal Toothpaste is natural toothpaste most popular for sensitive teeth in India. It includes a unique combination of as many as 24 barks, roots, plants and flowers that help in maintaining total dental hygiene. 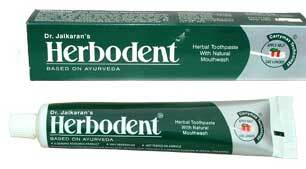 Herbodent Toothpaste is trusted herbal toothpaste available in the Indian market. It has the goodness of natural herbs that treats oral problems such as bleeding gums, cavities, dental plagues, sensitivity and pyorrhea. This organic toothpaste contains 21 active herbs. The Indian Market is also abundant in kids toothpaste. Click here to check our List. SLS as an ingredient is not a good thing! Can any of theae be used for 2.5yr old children? Himalaya or vicco which are v.easily avlbl. Can any of theae be used for under 2yr old children? ?